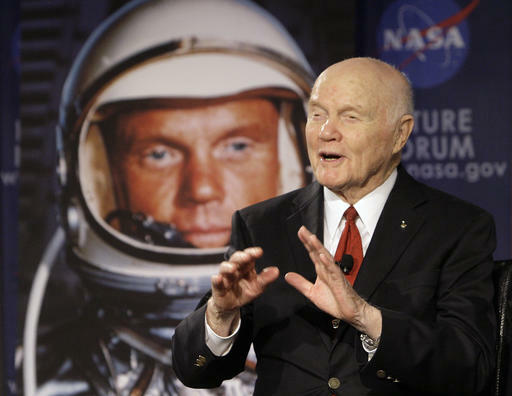 LOGAN, Ohio (AP) — An astronomy park named for astronaut-hero John Glenn is about to open in his native Ohio. The John Glenn Astronomy Park is located in Hocking Hills State Park in the southeastern part of the state. A grand opening ribbon-cutting is scheduled Thursday to coincide with the summer solstice. Director Brad Hoehne (HOH’-nee) will be joined at the event by Julianne Burroughs, board president of Friends of Hocking Hills State Park, and “Astronaut Harrison,” a 6-year-old Columbus boy obsessed with space. Activities will include sunset viewing, a sky diver and star and planet gazing through the park’s powerful telescopes. John Glenn died in 2016 at age 95. He was the first American to orbit Earth and a longtime Democratic U.S. senator.